The following rules and regulations have been established for the benefit of all users of The Big Splash family waterpark to assure safe operation and provide enjoyable recreational opportunities for all. Patrons are requested to observe these rules and to obey the guidelines of the Aquatics staff. Patrons violating swimming rules are subject to the withdrawal of their swimming privileges. No refunds will be given. The facility will close for a minimum of 30 minutes due to thunder or lightning for safety concerns. The 30-minute period will reset after each occurrence of thunder or lightning. In addition, the facility may temporarily close due to high winds or heavy rains that obstruct water clarity or cause unsafe conditions. The facility may close for any of these conditions; no rain checks or refunds will be given. The facility may close early due to low attendance. Call the hotline at 614-277-1818 for closure information. Proof of residency required for resident rates. Show photo I.D or photo I.D. with utility bill or pay stub. Children ages 11 years and younger must be accompanied by a person 16 years or older at all times. One 16 year old may be responsible for up to eight children. If there are more in your group, another person 16 years or older must be present. The Big Splash reserves the right to limit admissions due to safety concerns. Any person having an infectious disease or open sores will be refused admission to the pool. Any person who appears to be under the influence of alcohol or drugs will be refused admittance or asked to leave. All injuries must be reported to first aid personnel. Always notify a lifeguard of any unsafe situation. Read all signs upon entry as they further explain Big Splash rules and regulations, including slide use. Children or adults prone to accidents must wear swim diapers. Guests needing to purchase a child-size swim diaper may do so in Guest Relations for $1. Inflatable swim devices, including arm bands, are not allowed. Any flotation device being used must be U.S. Coast Guard approved. A seal inside the upper back will provide verification. For safety, only one person may use any approved device. 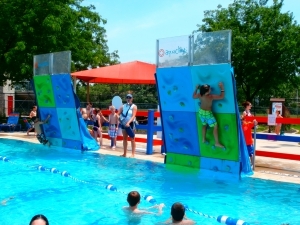 The Big Splash provides a limited number of approved life jackets for guests’ use. Please return these to the rack located by First Aid station. Flotation devices that have been used in non-chlorinated bodies of water may not be used at The Big Splash to prevent the spread of bacteria. Water noodles, beach balls, hard balls, sharp toys and squirt guns are not permitted. For your comfort, numerous chairs are provided. Please note that deck chairs are to be used by one person only and must remain in the designated areas. For your safety, it is important that they are not used as play structures. Please refrain from saving chairs for guests arriving later. To keep you safe, in-service trainings for our professional lifeguards are conducted throughout the season – please be courteous during these sessions. The sound system is for the hourly announcement and emergencies only, guests will not be paged. The following are not permitted within the facility: articles made wholly or partly of glass, chewing gum, alcoholic beverages, tobacco products, rafts, flotation devices not approved by the U.S. Coast Guard. Attendees may bring in personal-sized coolers. Pizza boxes and glass containers are prohibited. Proper swimming attire is required. Cotton and other inappropriate fabric release dyes, bacteria and fibers that degrade the water quality and damage filters. Metal accents can damage coating on equipment. You must be 48″ or taller to ride the two main slides. Obey staff directions at all times. Do not distract the lifeguards from their duties. The use of radios and MP3, tape or CD players is limited to personal listening devices with headphones. Rollerblades, skates, skateboards and bikes are not permitted in the aquatic center. Rest breaks are scheduled on the hour for 15 minutes. Minor (ages 17 years and younger) must exit the water. Children ages 3 and younger may remain in the water with an adult. Re-admittance into to the aquatic center requires a hand stamp when exiting. Stop at the entrance gate for a stamp. Swim lessons are available, please ask for details. Guests with special needs are welcome; staff is pleased to provide assistance. Photos and videos may be taken and used for promotion by staff. Climbers must be 48″ or taller. 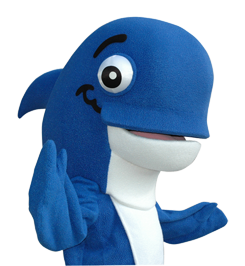 Shirts, including aquatic shirts or rash guards, are not permitted. Climbers may not wear any type of flotation device including built-in flotation swimwear. Only one person may use each wall at a time. Climbers may not jump from the wall and must enter water feet first. Climbers must be experienced swimmers; the water is five feet deep. A lifeguard must be on duty and running this attraction to climb. Only one swimmer is permitted in the drop zone at a time. Adults may not help children. This attraction will be available 30 minutes after the park opens until one hour before the park closes. For safety reasons, pregnant women and persons with heart conditions or back problems should not climb the wall. Persons must go down the slide in a feet-first position either seated or lying on their back. Spinning or tumbling or leaving the seated or laying position is not permitted. Masks, clothing with metal elements, flotation devices, and water socks or shoes are not permitted. Climbing up the slide is prohibited. After entering the slide flume, stopping is not permissible. 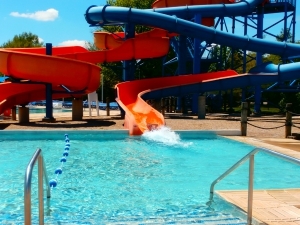 Riders must exit the slide pool immediately after splash down. Riders must be 48″ tall. Running starts are not permitted. Only one person is allowed down the slide at a time. Children may not ride in the laps of adults.